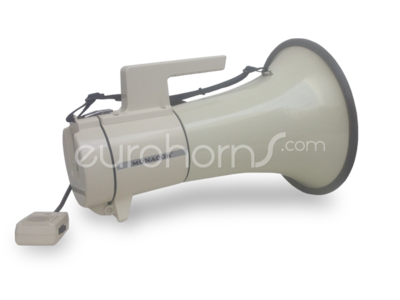 Electronic megaphone with separate microphone on cord. Maximum output of 35 Watt, produces up to 122dB. Comes with 12v connection cable, Shoulder strap and built in siren. Electronic megaphone with separate microphone on cord. Maximum output of 35 Watt, produces up to 122dB. Comes with 12v connection cable, Shoulder strap and built in siren.